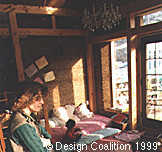 Straw-clay (sometimes used interchangably with "light clay") is a building material with unique properties. It is a very low-impact material, site-made of unprocessed earth and waste agricultural fiber. In varous forms, straw-&-earth mixtures have a long history of successful use in buildings of many cultures. It is solid, durable, non-toxic, and semi-structural (self-supporting within reasonable limits). It is both a reasonably good insulator and a thermal storage medium. It accepts natural admixtures such as linseed oil, casein and prickly pear extract for greater water-resistance and durability. It handles water vapor well in a cold climate, and it is resistant to rot, vermin and fire. 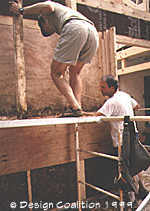 Although there are many variations and techniques, the process shown here describes light wall construction of about 12 to 15 pounds per cubic foot (325 to 817 kilos/cubic meter) with an estimated R-value (a measure of insulating value) of about R-19 (u = .0526 BTU/hr/sq.ft./degree F) for a finished, dry 12" (30 cm) thick wall. 2. Mix the clay slip. 3. Coat the straw with slip. 4. 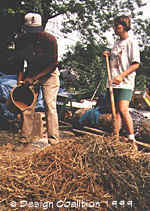 Place and compacte the straw-clay. 6. Finish the interior and exterior surfaces. Left: Clay-rich soil, dry, 'shredded' and ready to mix in the mortar mixer. 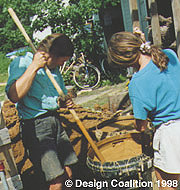 Above: Mixing the clay slip...by hand. Above: Adding slip to the straw. Clay is mixed with water to form slip. Slip can vary in consistency between thin (like cream) and thick (like a milk shake - at least, such comparisons are meaningful in the Dairy State!). We're using a medium thickness here, mixed with an electric mortar mixer with rubber paddle blades. The clay is not a pure potters' clay, but rather simply earth loam with a high clay content. A bale of wheat straw (preferred for it's strong, waxy stalk) is opened on a plywood mixing floor. Then clay slip is poured over it and , like dressing on a salad, the straw is tossed until it has just a light coating of clay slip. The mixture's readiness is tested by grasping a bunch of straw in the hand. If it sticks together in a clump, the batch is ready to be compacted into the form. 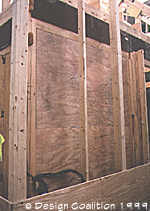 Plywood forms can be washed off and reused for floor or roof sheathing. Above: Wall formwork ready for straw-clay. Above: Placing the straw-clay in the forms. Above: Legwork -- compacting the straw-clay. 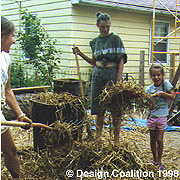 The slip-coated straw is then placed into the forms and compacted. 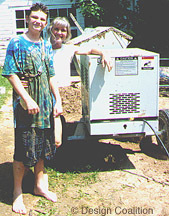 Feet are best; for tight spots we use tampers made from short lengths of wood, such as a 2 x 4. 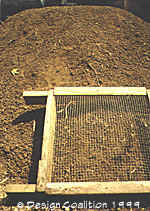 Forms are removed immediately after being filled to the top, to avoid surface mildew growth and to allow the new wall to begin drying immedieately. Depending on the season and the climate (wind and relative humidity), full drying of a 12" (30 cm) thick wall may take a month to several months. 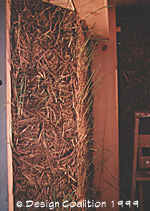 In the first week or so wheat grass usually sprouts out of the wall until the wall surface dries. 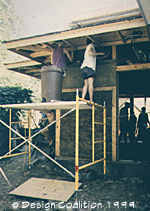 Above: Removing the form as the wall goes up. Above: Wheatgrass growing on the new wall. Above: The room is usable before plastering. In this sequence of photos, the work is proceeding by hand. However, certain farm implements and custom-made equpment that we and others have devised can be used to mix and deliver the straw-clay mixture to the forms. These and other means of simple mechanization can dramatically speed up the labor-intensive process. Click here for the Forest Products Lab Report on Straw Clay. Visit our section on the Affordable Natural House for more on our research into straw-clay.